The changing season’s can be hard on your aircrafts exterior, interior and engine. 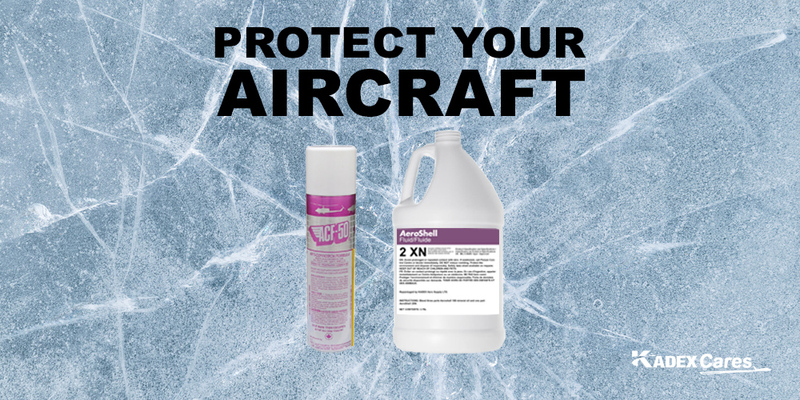 The KADEX Cares team suggests using these two products to protect your aircraft. ACF50 is an Anti-Corrosion Formula that is a state of the art, specifically designed for the Aerospace Industry. It is an ultra Thin Fluid Compound (TFFC) that actively treats metal using advanced polar bonding technology. ACF-50 actively penetrates and “creeps” into the tightest seams, lap joints, micro cracks, and around rivet heads, displacing moisture and other corrosive fluids (orange juice, coke, coffee, salt water) in these corrosive prone areas. ACF-50’s thin film acts like an “OFF SWITCH” for corrosion remaining effective for up to 24 months. Available in Aerosal Cans, 32oz Bottle with refillable Trigger Sprayer included and bulk sizes. AeroShell Fluid 2XN is a corrosion preservative concentrate for protecting infrequently used engines. It uses an ashless anti-corrosion additive package and highly refined mineral base oils to protect internal engine surfaces from the Effects of humidity. It is also designed to neutralize the acidic by-products of oil oxidation and combustion. AeroShell Fluid 2XN can be used neat to long-term storage, but it is typically mixed with one part AeroShell Fluid 2XN to three parts fresh AeroShell Oil 100 to create an inhibited oil. It can also be sprayed undiluted on piston-engine exhaust ports, Rocker arms and accessories to provide additional protection. KADEX now offers AeroShell 2XN in two sizes 1GL and 5GL.